Home > Football > Sleeping Giants Awoken? Are Leeds United Finally on the way back to the Premier League? When Leeds United reached the Champions League semi-final in 2001 few could have fathomed that just three years later the club would be on the verge of collapse. Crashing out of the Premier League and with the club’s finances in turmoil one of English football’s true powerhouses was sent into a period of in the wilderness as the club spiralled down the football league. Fast-forward fifteen seasons and the club is still waiting on its return to the top-flight. However, under new boss Marcelo Bielsa that return is looking ever more promising as he currently has the side sitting on top of the Championship table. The club’s long suffering fans feel that this is their year as the swashbuckling style of football being played by Bielsa’s team has made Leeds the team to watch in the Championship this season. Many feel that for Leeds it’s now or never this season if they are to return to where they feel they truly belong, fighting it out with the best teams in the country for the country’s top prizes. Since that relegation in 2004 the club has come a long way and has experienced a lot more downs than ups but that heartache is looking like it may end in jubilation come May. In the early 2000’s Leeds were once again becoming a force in the English game having struggled to gain any real success after winning the last Old First Division title in 1992. David O’Leary had forged a formidable young team that with the backing of then chairman Peter Ridsdale looked to be on the cusp of achieving something special. The young exciting team had fans dreaming of a return to the glory days witnessed under Don Revie through club legends such as Giles and Bremner. However, in order to compete with the top teams in the country Leeds United had borrowed heavily which saw Leeds engage in a major spending spree bringing in the likes of Rio Ferdinand, Robbie Fowler and Olivier Dacourt as they sought silverware. This borrowing scheme headed by Ridsdale was built on the assumption that Leeds would make the Champions League every season. However, in both the 2000/01 and 2001/02 seasons the club just missed out on the lucrative competition which sent the club into freefall. As a result the club had to offload their stars to cut costs with Ridsdale saying “We lived the dream”. The instability saw Leeds fall into the Championship with the club recording debt of over £100,000,000. Further humiliation would see the club fall not only into administration in 2007 but also into the third tier of English football. Ken Bates came in to steady the ship which would see the club return to the Championship in 2010 under a promising Simon Grayson side. The return to the Championship almost saw a return to the Premiership as the club just missed out on the play-offs. However, Leeds would once again enter into a murky period as Ken Bates sold to a consortium which was never revealed leaving fans questioning who owned their club? This period would see the breakup of the promising team forged by Grayson as the club still crippled with debt offloaded many of their promising young stars to Premier League clubs. This would see the club stagnate as mid-table became an all too familiar reality for the club. Massimo Cellino’s takeover would only highlight this instability as six managers were sacked over two years. Once again Leeds United was made out to be a laughing-stock with no real future on the horizon. Gary Monk’s impressive 16/17 campaign at the helm which saw the club narrowly miss out on the play-offs earmarked a shift in fortunes for the club. Andrea Radrizzani stepped in to take full ownership of the club at the end of the season and on the 28th of June 2017 he bought back Elland Road which saw the stadium come under the property of the club for the first time since 2004. Early promise under Thomas Christiansen fizzled out last season with the club going back to the drawing board over the summer. In came the club’s highest ever paid manger Marcelo Bielsa on the 15th of June. The Argentinean is regarded as the blueprint for managers such as Mauricio Pochettino and Pep Guardiola who described Bielsa as “the best coach in the world”. Bielsa’s attention to detail cannot be understated as he chooses formations by measuring pitch dimensions and upon taken the Leeds job revealed that he had watched all of Leeds’ matches from last season saying he had “made up my mind on all my players”. With an impeccable resume which has taken Bielsa all over the world Leeds fans were once again optimistic but not even the most optimistic fan would’ve envisaged the start to the season the club has experienced. An opening day demolition of title favourites Stoke was a sign of things to come for the club. Victories over Derby, Rotherham and Norwich soon followed as Leeds went straight to the top of the table. Bielsa’s style of football more than anything else has endeared him to the Leeds fans as the Argentinean’s possession based pressing football has made Leeds the envy of Championship clubs. Key signings such as Patrick Bamford and Barry Douglas has reinvigorated the squad and boosted the clubs chances of promotion. The emphasis on possession has seen the club gain the third highest percentage for possession across Europe behind Manchester City and Barcelona. Averaging 442 short passes per game they have well and truly become the pass masters of the Championship. Leeds have dropped off their early season standards over the last month or so seeing them only pick up four victories from their last eleven matches. For all the possession they have garnered in their matches their problem has been making this pressure count. Although this drop-off in form can also be accounted to the fact that the several key players have been missing through injuries as Roofe, Hernadez, Bamford, Douglas and Ayling have all spent periods on the sideline. 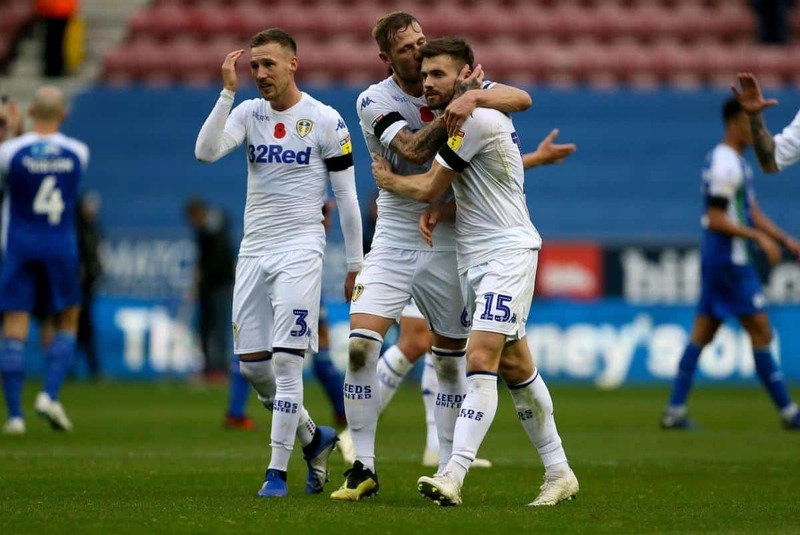 Sunday’s 2-1 over Wigan Athletic at the DW Stadium saw a much-needed return to winning ways and sent Leeds top of the league on goal difference. Bielsa echoed the frustration of recent results saying “if we want to stay first, we have to win more regularly”. The upcoming fixture away to West Bromwich Albion is another crunch match for the club as they look to beat one of their promotion rivals. West Brom’s recent form must not deter Leeds from just how difficult an obstacle the match at the Hawthorns will be in their push for promotion. If Leeds are to return to the top flight victories over promotion rivals such as West Brom are tantamount to their success. Bielsa recognizes that through their style of football they will be able to achieve this saying after the Wigan game “To be first in the Championship, we have to make a difference between us and the other teams”. Leeds fans will be tentatively hoping over this season that they can finally end their agony and return to the Promised Land. Statistics Courtesy of www.whoscored.com and www.efl.com. Hi my name is Sam Meagan and I am a passionate football writer from Dublin.